As well as contribute to the lore of Daito-ryu Aiki Jujutsu , we purport to convey the true and genuine teachings of the former masters, Horikawa Kodo and Okamoto Seigo. “Roppo” of the Roppokai represents the”Top and bottom front, rear, left and right.” This is from the words of Takeda Sokaku. 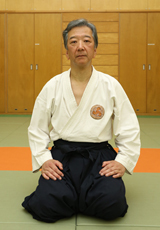 Horikawa Kodo scooped out the meaning and explained to Okamoto Seigo “In martial arts, not only planar attack, always, must be taken into consideration steric attack. In other words, there is a need for freedom of movement. Roppokai has been put is the sense of doing the freely of themselves for the three-dimensional attack. trained Aikido at Aikido Honbu dojo.